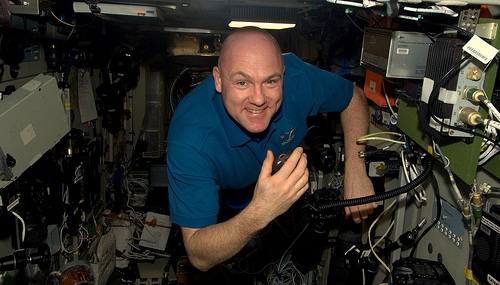 The QSO (radio contact) between the students and astronaut Andre Kuipers on board of the ISS took place on March 21, 2012 at 9:39 am. Wednesday, March 21st, 2012, at 09:38 a.m. in the Swiss Air Force Museum "Clin d'Ailes" Payerne: In his role as a "tracker", Manfred, HB9ACA watched very closely his monitor. The "footprint" of the ISS moves inexorably closer to Payerne. Manfred takes a look out of the window to check the aerial. At the same moment, the X-Quad antenna, mounted on an 8m mast, starts - operated as if by magic - to turn toward 315° north-west. From know, the ISS will show up in 45 seconds on the radio horizon. 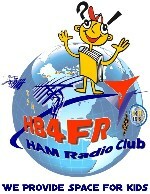 Manfred quickly turns to the radio operators and reports: "In 45 ready to go"! Then, he turns back to his task. Bertrand HB9SLO, Operator I, stretches in order to fight against his tension and loosens slightly his collar. Quickly, he checks once again the settings of his transceiver and then it's time: at 09:39 local time, NASA had determined, the ISS would be "in range"! “OSCAR ROMEO FOUR INDIA SIERRA SIERRA - DE HOTEL BRAVO NINE SIERRA PAPA ALPHA CHARLY ECO – OR4ISS DE HB9SPACE – PLEASE COME – OVER”! Bertrand speaks with a loud, clear voice into his microphone. No answer. “Must be the ridges of the Jura covering the Space Station”, Berti thinks, “so, call once again”. After the second call, first a faint clicking noise, and then the clear, distinct voice of astronaut Andre Kuipers sounds from the loudspeakers: „HOTEL BRAVO NINE SPACE DE OSCAR ROMEO FOUR ISS – FIVE NINE – GO AHEAD“! A liberating smile spreads across the face of Herbert HB9BOU, president of the Amateur Radio Group of the museum. "The QSO is in the bag," he thinks satisfied and our astronaut Claude Nicoller, HB9CN takes the microphone: „HI ANDRÉ - THIS IS CLAUDE HB9CN SPEAKING - HOW ARE YOU DOING MY FRIEND“? Claude welcomes his friend aboard the ISS, gives a brief introduction and passes the microphone to the first of the 20 students, so that they can ask their questions to astronaut André Kuipers.. Same time, in the radio control car next to the museum: Daniel, HB9DLZ is sitting in a comfortable office chair in front of his screens with which he monitors the frequency spectrum as well as the emissions from the ISS and HB9SPACE. QSOs like this one are always closely followed by radio ama-teurs and it may happen that some indelicate station interferes with the ARISS QSO. To err is human and yes, it could happen that here or there wrong offsets are used. Daniel can detect everything at a glance and take the necessary measures. Nothing is left to chance! Back to the museum: Meanwhile quite a number of students have directed their well worded and very interesting questions to André Kuipers, who answers them in a very clear and concise manner. It is absolutely not acceptable to waste even a second, because the ISS - constrained by the radio horizons - can be reached at maximum during 10 minutes by radio! Pierre-André, HB9AZN and Paul-André, HB9RXV as well as their teammates from "SwissATV" - our amateur television specialists - are very busy too. They are recording the entire action in HD-quality and provide the attending media with the signals for their TV broadcasts and for the live streaming on the Internet. The more than 100 visitors, which have followed silently, but with interest and attention the whole event, cannot hold back any longer and close the radio contact between the students and the ISS in their manner: with spontaneous, thunderous applause.s. Presentation of the technical project of the electronics students: The ARISS project requires that the participating students and apprentices deal during a certain time with Space topics. In this case, a technical project had to be developed and built by the students of the Education Center of the Air Force Base Payerne. he project named "HEIDI" had value of diploma project. The students had to develop and build a payload for a stratospheric weather balloon with a video camera, a transmitter in the range of 13 cm waves for transmitting live images during the flight, a HD video camera with memory onboard storage, various meteorological sensors, a GPS receiver with a APRS-transmitter to track the trajectory of the balloon and its payload, and finally - probably a world first for weather balloons - a device for measuring temperature inside the balloon with data transmission. The project was a real technical challenge for the students. E.g. the total weight of the balloon payl-oad was limited to 2 kg, and electronic and optical modules must operate in a wide range of temperatures, from ambient temperatures at departure up to -60 °C at the border of the stratosphere. The students reached the culmination of their work with the successful launch of the stratosphere balloon probe on March 15, 2012, at 1:57pm. After 1 ½ hour of flight, it reached at west of "Schwarz-see" the apex at an altitude of 32'152 meters above sea level, at a speed of 39 km/h. Then, suddenly the probe abruptly turned towards Jaun, a small town in the Fribourg Mountains. Over this town, the balloon burst and finally "Heidi" ended the journey in the tops of a pine tree. There, Mike HB3YWU and his "balloon hunters" - some had even come from neighboring France - found the Payload they had followed all the time with their technical equipment. By the way: "Balloon Hunter" is also an interesting possibility, which provides the broad pallet of the amateur radio service. The visitors were very impressed with the work of the students. With their impressive presentation, the projection of the beautiful and exciting HD video recordings made during the flight of the balloon probe and the subsequent aperitif, our "Operation ARISS-2012" ended with a big success. Push the play button below to listen to the students questions and answers from André Kuipers, Dutch ESA astronaut, aboard the ISS.